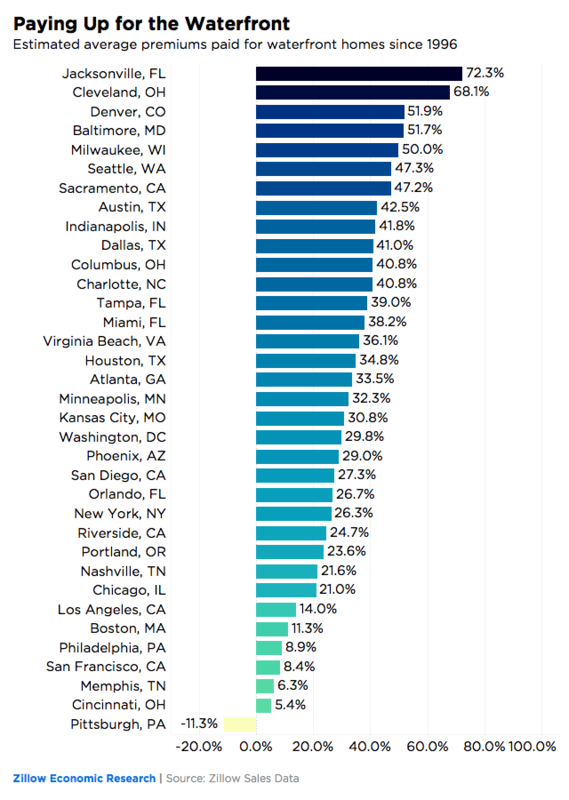 A recent report by Zillow Research examined the price premiums for single-family waterfront homes in 35 U.S. cities (see graph below). According to the report, “As the housing market has bounced back [from the housing bust], the prices for non-waterfront homes have returned to their pre-recession peaks, while waterfront homes have not.” Americans seem to have become more cautious about buying waterfront property; the article suggests changing tastes, hurricane fears, and climate change as possible reasons. According to Zillow Research, the total estimated value of waterfront homes is $134 billion as of June 2018. Over the years, the sale price premium of such homes has fallen to 36 percent, “down from 54 percent in 2012 and 41 percent on average over the past 22 years.” Has waterfront property become a bargain? The answer is a qualified Yes. Coming in at number four on the list is Baltimore with a 51.7% premium on waterfront housing since 1996 and Washington DC at 29.8%. While these rankings would look different if calculated in dollar amounts, there are some key takeaways from this study. Having a home on the water in the Baltimore area seems relatively affordable, considering that the median price of homes in the region is $263,000 as of September 2018. 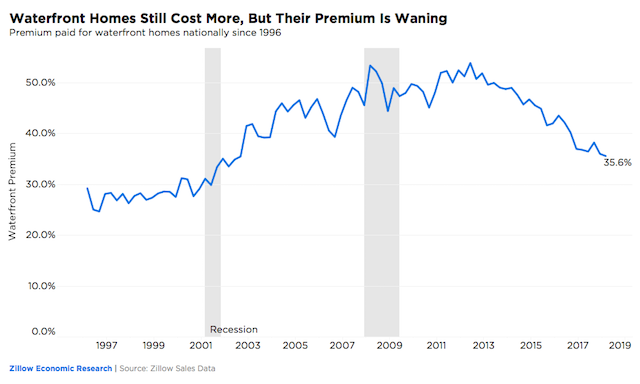 Consider the high prices of San Francisco ($947,700), Seattle ($486,000), and New York ($426,300), which include lower waterfront premiums, yet have significantly higher base prices. Baltimore’s median price plus its average premium totals $399,000, well below other coastal cities’ medians. This study also shows that Baltimore is a relatively affordable place to live, especially for a city with a wealth of high paying jobs and a cluster of top tier research and educational institutions. The benefits of proximity to Baltimore and miles of coastline cost less than most cities. As the article notes, waterfront property totals approximately 0.4 to 0.6 percent of all property transactions in a given year, so as this region continues to grow in size and opportunities, expect waterfront properties in this region to grow in value in the coming years.